Tetranychus lombardinii Baker & Pritchard attacks banana, beans, cassava, cotton, cucumber, melons, papaya, passion fruit, potato, soybean, castor bean, sweet potato, tomato, tobacco, alfalfa, sorghum and a variety of other plants in Asia, Africa, Indonesia, and Australia. Tetranychus macfarlanei Baker & Pritchard attacks bananas, beans, cotton, cucumber, eggplant, melons, okra, papaya, peanut, watermelon, and ornamentals in India, Madagascar, Mauritius, and the Canary Islands. Tetranychus lambi Pritchard & Baker attacks banana, cassava, beans, clover, cotton, cucumber, eggplant, fruit trees, okra, peanut, soybean, squash, tobacco, grasses and ornamentals in Iran, Asia, and most Pacific islands including Australia and New Zealand. Tetranychus fijiensis Hirst (the only species known with only 2 pairs of proximoventral hairs) attacks citrus and other fruit trees and ornamentals in India, Southeast Asia, and many Pacific islands, including Australia. Tetranychus piercei McGergor is a pest of banana, beans, cassava, eggplant, mulberry, papaya, passion fruit, peach, sweet potato, and a diversity of ornamentals primarily in Asia and has recently been found in the US. Tetranychus truncatus Ehara attacks banana, cassava, beans, maize, cucumber, eggplant, fruit trees, okra, onions, orchids, rice, soybean, sweet potato, and a variety of ornamentals in Asia and on Pacific islands. Tetranychus amicus Meyer & Rodrigues attacks banana, cassava, beans, cotton, eggplant, peanut, soybean, sweet potato and ornamentals in South Africa and on Indian Ocean islands. With 1 pair of paranal setae (h3); setae h2 terminal, not in paranal position; seta h1 absent. Empodium split into 2-3 pairs of proximoventral hairs. Mediodorsal empodial spur generally present, sometimes well developed. 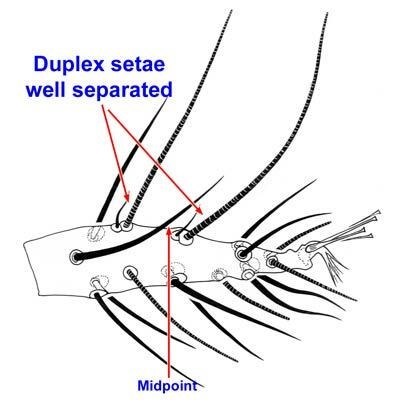 Duplex setae of tarsus I well separated. Similar taxa. The empodia have tenent hairs in the Bryobiinae. Eutetranychini (e.g. species of Eutetranychus) have a claw-like or highly regressed empodium. Other Tetranychini have either 2 pairs of paranal setae (e.g. Allonychus, Panonychus) or have hooked empodia with proximoventral hairs and the duplex setae of tarsus I distal and adjacent (e.g. Oligonychus) or lack an empodial spur and have peritremes anastomosed distally (Amphitetranychus). Baker EW & AE Pritchard. 1960. The tetranychoid mites of Africa. Hilgardia 29(11): 455-574. Baker EW & DM Tuttle. 1994. A guide to the spider mites (Tetranychidae) of the United States. Indira Pub. House, West Bloomfield, MI: 347 pp. Beard JJ, Walter DE, & Allsopp P. 2003. 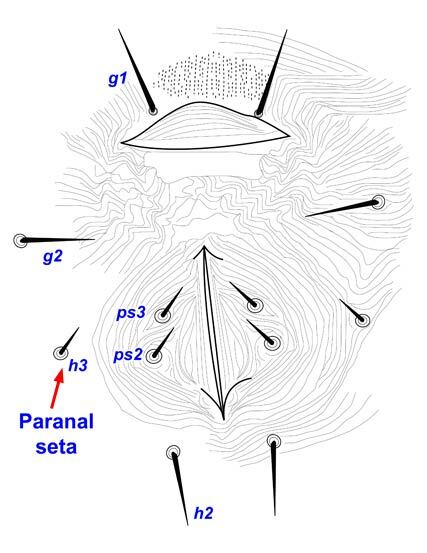 Spider Mites of Sugarcane in Australia: A Review of Grass-feeding Oligonychus Berlese (Acari: Prostigmata: Tetranychidae) with the description of four new species. Australian Journal of Entomology 42: 51-78. Bolland HR, J Gutierre & CHW Flechtmann. 1998. World Catalogue of the Spider Mite Family (Acari: Tetranychidae). Brill: Leiden. Flechtmann CHW & DK Knihinicki 2002. New species and new record of Tetranychus Dufour from Australia, with a key to the major groups in this genus based on adult females (Acari: Postigmata: Tetranychidae). Aust. J. Entomol. 41: 118-127. Helle W & MW Sabelis (eds.) 1985. Spider Mites, Their Biology, Natural Enemies, and Control, vol. 1A. Elsevier: New York. Meyer, M.K.P. 1974. A revision of the Tetranychidae of Africa (Acari) with a key to the genera of the world. Dept. Agr. Tech. Serv. Mem. 36: 291 pp. Meyer, M.K.P. Smith 1987. African Tetranychidae (Acari: Prostigmata) - with reference to the world genera. S. Afr. Dept. Agr. Water Supply, Entomol. Mem. No. 69: 175 pp. Mignon A & CHW Flechtmann 2004. First additions and corrections to the World Catalogue of the Spider Mite Family (Acari: Tetranychidae). Intern. J. Acarol. 30: 143-152. Navajas M, J Gutierrez & T Gotoh 1997. Convergence of molecular and morphological data reveals phylogenetic information in Tetranychus species and allows the restoration of the genus Amphitetranychus (Acari: Tetranychidae). Bull. Entomol. Res. 87: 283-288. Ochoa R, H Aguilar & C Vargas 1994. Phytophagous Mites of Central America: An Illustrated Guide CATIE, Turrialba, Costa Rica. Tseng Y-H 1990. 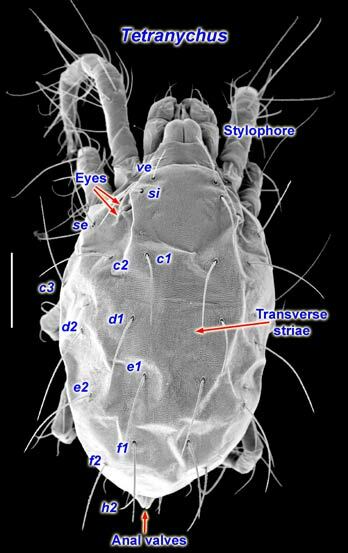 A monograph of the mite family Tetranychidae (Acarina: Trombidiformes) from Taiwan. Taiwan Museum Special Publication series 9. 224 pp. Zhang Z-Q. 2003. Mites of greenhouses: identification, biology and control. CABI Publishing, Wallingford: 244 pp.